The complete guide with all the steps to get back together with an ex! After a breakup, you feel awful and completely lost. You don’t dare talk about your desire to get back together with your ex to your loved ones because you’re afraid that they’ll judge you. Friends tell you to turn the page and move on and you can end up letting yourself drown in regrets... Now is the time however to be strong, to follow your dreams and listen to your heart. To reignite a woman’s love you must understand her fully and completely, and use truly effective tools. For 11 years Alex Cormont has been helping men who have found themselves in the same situation as you to get back together with the women they love. His book is a compilation of all the techniques, tips, and actions to set into motion after a breakup. Thanks to this eBook you’re going to significantly increase your chances of getting her back and you’ll learn the exact methods to use in order to make it happen. That said, there are tools that truly work and can turn things back around very fast. Within 3 weeks you’ll be able to change everything thanks to concrete techniques that are based in human psychology, the art of persuasion, and communication. Keep in mind that these work no matter what your situation is. Be like James who was in a relationship for 5 years and understood how long he needed to use Radio Silence. Take Robert as an example, who wrote a letter that moved his ex to tears, or follow in Joseph’s footsteps, who got his ex back after a relationship that lasted only a few months. Dan handled meeting up with her ex perfectly thanks to 3 simple, yet effective steps. You will be able to understand the breakup and analyze the situation in order to design the best action plan and to get into your ex’s head. Everything you do and say will be exactly what she wants from you! You’ll understand why you have to do the opposite of what you want and take both physical and emotional distance. Have you made mistakes? Don’t worry, you’ll gain access to the tools that will help you make up for these errors and make your ex forget they ever happened! You’ll be able to show your ex that you’ve changed and she will TRULY appreciate your evolution. And last but not least, the all-important BONUS...The FRENCH TECHNIQUE OF THE HANDWRITTEN LETTER that can be used in the reparation process of every relationship. You will receive 3 model letters that you can directly send to your ex, or rewrite, and it will deeply move your ex. 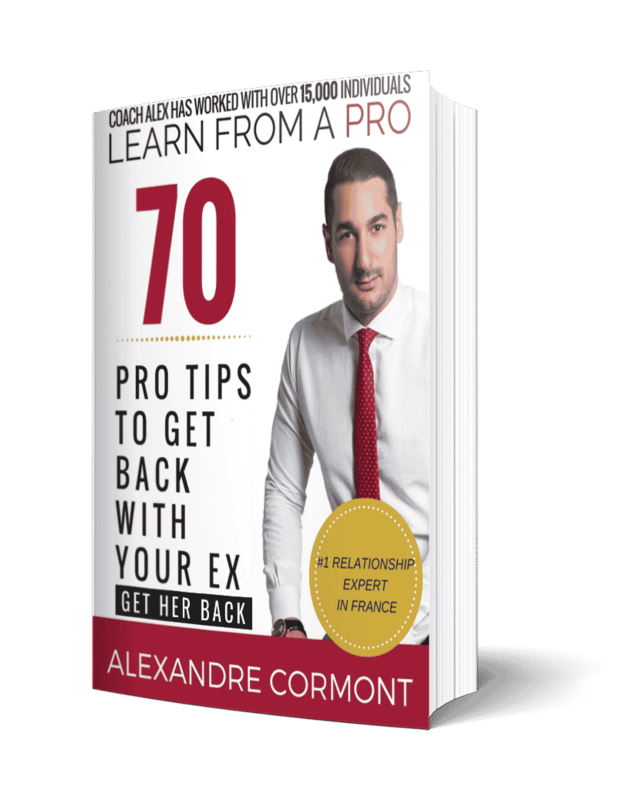 I know how afraid you are that she won’t come back, that she will find another man, or that she will forget about you completely... Don’t let yourself drown in negativity anymore, because with this book written by a French expert, you’ll be able to start using the perfect strategy to get your ex back! If you truly love your ex and you sincerely want to get back together, if you don’t want to suffer, and you want to get back on the right track, all you have to do is read and use the tools you’ll find in our eBook! A book written by a true expert in sentimental guidance, with over 15,000 coaching sessions. All situations are taken into account, whether you were together for 3 weeks or 30 years, and the techniques are very different! Start using these tools immediately! You will be able to download your eBook right away. In a few minutes you’ll have a complete guide in your hands, so don’t sit with your arms crossed! You’ll finally be able to stop making fruitless efforts. You have the possibility to once again be with the person you love. Don’t let this chance pass you by because happiness is so close... All that’s left to do is to use the methods and tools presented by your expert. Tons of men are successful in the process of getting back together thanks to this book... Be the next one! For a long time we thought that you just had to turn the page and move on without giving your relationship a second chance, but that is no longer the case. If you don’t know the methods for getting a positive reaction from the woman you love after a breakup, all you have to do is read this eBook. Now it’s up to you to use techniques from the world’s Number One Coach in getting people back together. 70 Pro Tips + modern analyses + powerful testimonials + examples of the letter to send your ex. Whether you were in a shorter relationship or a long-term relationship, whether or not your ex is still speaking to you, you will find the answers within these 70 Pro Tips for getting back together with your ex.